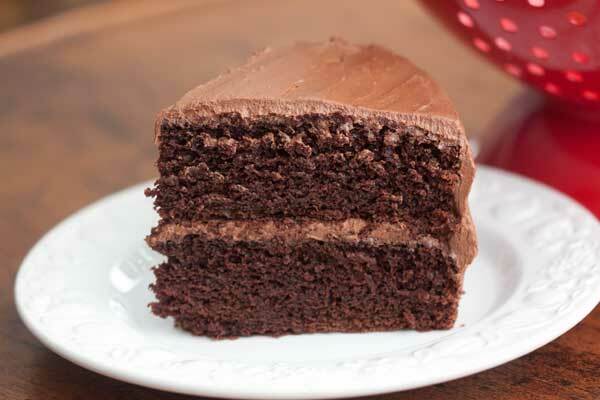 Pat’s Chocolate Layer Cake is adapted from a recipe in a cookbook put out by our grocery store. It was submitted by Patricia from Llano, who notes that she was trying to recreate the recipe as her mother made it. 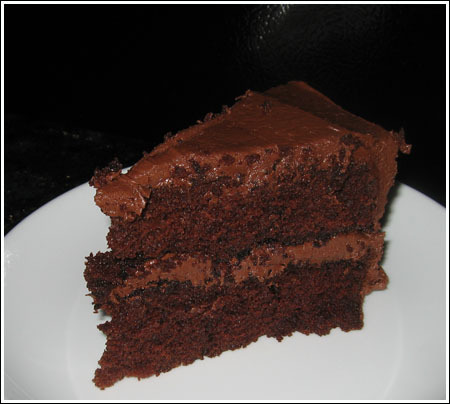 If the recipe looks familiar, it’s because it’s very similar to Hershey’s Perfect Chocolate Cake. This version is different in that it has 1/4 cup more sugar, 1/4 cup more flour and 1/4 cup more cocoa. It also uses half and half instead of milk, hot coffee instead of water and a tad more vanilla. Pat recommends Mexican vanilla, but don’t sweat it if you can’t find Mexican vanilla because the cake is just as good with Adam’s extract. Now I’d have to eat the cakes side-by-side to say which version is better, but I’m giving Patricia’s version a thumbs up. It’s especially nice in that it doesn’t require an electric mixer. I made the cake with a bowl and mixing spoon. The frosting is a different story, and will require an electric (hand held) mixer. I’ve included notes on that at the end of the recipe. Pat's Chocolate Layer Cake is an easy chocolate layer cake made with half & half cream. Preheat oven to 350 degrees F. Grease and flour 2 9-inch round cake pans. In a large mixing bowl, stir or sift together the sugar, flour, baking soda & baking powder, salt and cocoa powder. Stir in half & half, eggs, oil and vanilla until very well mixed (I do this with a heavy duty spatula scraper), then stir in coffee. Batter will be wet and soupy looking. Pour into pans and bake for 35 minutes or until cakes test done. Let cool on rack for 10 minutes, then flip from pan and cool completely before frosting. To make the frosting, beat the softened butter and about half of the sugar until creamy. Beat in sour cream and cocoa powder until smooth. Gradually add remaining sugar and enough half & half to make the icing spreadable.